What are your gifts and how can you can put them to use in your everyday life? Participants will take the Clifton Strengths Finder assessment, discuss their unique strengths and learn about the strengths of others. In this workshop, you’ll learn practical ways to apply your strengths at work, in personal relationships, and through volunteering time in service. 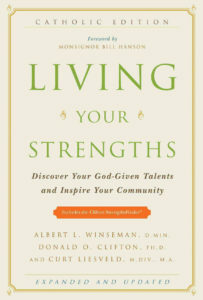 By learning about and cultivating your strengths, you act as a steward of the unique gifts God has given to you. A donation of $20 is requested to offset the cost of materials. Both intro meeting and workshop will meet in the parish center at 1950 N Kenmore Ave. If you cannot attend the intro meeting, you can arrange to pick up materials during office hours. Email robrien@stteresaparish.org with questions. Claire Kenkel is a Senior Consultant at Root, Inc., focused on strategic transformation and culture change in hospitality and manufacturing clients. Prior to joining Root, Claire gained consulting experience with Gallup, where she was also certified as a CliftonStrengths coach. Claire joined St. Teresa of Avila Parish in 2015. Her CliftonStrengths Signature Themes are Learner, Achiever, Significance, Input, and Focus.